Silent Gliss Curtain Tracks | Buyers Guide | Which track is right for you? Home » Inspiration & Advice » Silent Gliss – which curtain track is right for my requirements? Silent Gliss curtain tracks are superb, offering exceptional quality at good value prices. However, there are many tracks to choose from which can be a bit of a minefield working out which curtain track is most suitable for your requirements! Silent Gliss curtain tracks are world famous and well known for their quality and reliability. They were first invented in 1952 when a Swiss engineer combined nylon gliders with aluminium tracks. The result a brilliant silent curtain track. Silent Gliss have since gone on to make tracks which could be bent and can be electrically operated by a push button control. To find out more about the full range of Silent Gliss curtain tracks please read our buyers guide below. We also have a YouTube video available on our channel where Debbie from The Home of Interiors will explain the different Silent Gliss track options. All Silent Gliss curtain tracks come with universal brackets, this means they can be wall or ceiling fixed. There are extension brackets available, so if you have this requirement please get in touch with The Home of Interiors and we will create a bespoke quotation to meet your individual requirements. All of the Silent Gliss curtain tracks can be cut to your exact measurements (to the mm), which is ideal if you are fitting wall to wall and also avoids you having to cut yourself. All of the tracks are available up to a 6 meter length as a single track profile which means you can join 2 of these together to give you a 12 meter stretch for extra large rooms. The Silent Gliss 6 meter profile is an ideal solution for extra wide windows and bi-fold doors. As the brackets do not interfere with the track profile at all it also means you can position one curtain on the track and draw it the whole way across to the other side, offering more flexibility in comparison to other curtain tracks on the market. All of the Silent Gliss curtain tracks can be bent for bay or L shaped windows, however a specialist bending tool is required so we do need to bend the tracks for you. Silent Gliss are brilliant for bay windows, as the brackets do not interfere with the track profile there is a smooth glide around the corners. Double brackets are available so you can position 2 tracks one in front of the other, ideal for nets, voiles and curtains. If you have a requirement for wall fixed curtains please contact us for a bespoke quotation. If you ordering for ceiling fixed tracks you can simply position one in front of the other and order the 2 tracks separately. Due to the long track profiles available as single pieces (and you can join 2 together with connecting bridges to double the maximum widths) they are a great solution for extra wide windows and bi-fold doors. Maximum width information is stated on the product specification tab on each product page. Hand Drawn or Corded Tracks? The first decision you need to make when choosing Silent Gliss is whether you would like hand drawn or corded tracks. If you decide to go for a hand drawn option you may wish to purchase a Silent Gliss draw rod, which is a long slim wand which attaches to the lead glider on your track and sits behind the curtain when not in use. You can use the draw rod to open and close your curtains. A draw rod is ideal if you have delicate or light coloured fabrics to stop finger marks on the curtains. 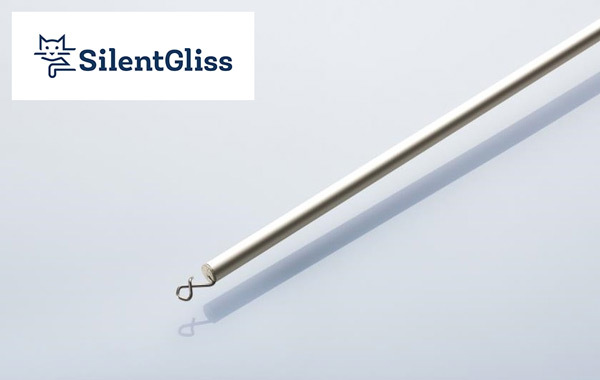 If you have light curtains, nets or voiles the Silent Gliss 1090 is a slim, unobtrusive, yet deceptively strong track. Available in white and silver it works well as a double track with a Silent Gliss 1080, 1280, 3840, 3000 or 3900 track. Hang voiles off the discrete 1090 track at the back and one of the other tracks can take the heavier curtains at the front. The Silent Gliss 1021 (designed to be wall fixed) and 1025 track (designed to be ceiling fixed) have been designed to be fixed directly onto window frames, doors or wooden battens, and are widely used on trucks, boats, motor homes, camper vans and caravans. They have pre-drilled holes so no requirement for brackets. These tracks are available in white, silver, bronze and gold. The Silent Gliss 1080 track is extremely popular and is suitable for medium weight curtains. The 1080 track is available in white, silver, black, bronze, brushed aluminium, gold and cream. Download the Silent Gliss 1080 specification brochure here for more information and dimensions. The standard brackets can be wall or ceiling fixed and are hidden by the track profile when installed for a neat finish. Installation is straight forwards too. Simply secure the brackets onto the wall / ceiling and then the track is put into position and clipped in place. Single tracks available up to 6m lengths – if you are ordering a long track please bear in mind the logistics of getting the track to the room it is going to be installed in. It’s tricky to get a 6m track around a corner!! We can split longer lengths if required for practical reasons. The other option for light to medium weight curtains is the Silent Gliss 3840 curtain track. The 3840 is available corded or uncorded and is available in antique bronze, black, gold, silver and white. The profile has been designed to be ceiling fixed using the ceiling fix clamp style of bracket. This provides a very flush fit to the ceiling. Wall fix brackets are also available. The slightly curved track profile (shown below) offers a contemporary, sophisticated look and looks really neat and stylish. The profile looks the same from both sides so it can be used as a room divider. You can upgrade to roller glider on this track. This is recommended if your curtains are on the heavy side of medium to increase the glide operation. Please call us for a quotation. This track is also compatible with the Silent Gliss wave gliders. Wave gliders give a neat fold to your curtains for a really polished look. They are particularly popular for use at bi-fold doors or extra wide windows. Please note you do need to use specific wave heading tape on your curtains so you can’t install shop bought curtains on a curtain track with wave gliders. If you are having your curtains made you will need to tell your curtain maker you would like wave gliders. For more information please click here to be taken to the article about wave heading. For a quotation all we need to know is whether you would like the track hand drawn or corded, the colour of the track, track length and if you require 80mm or 60mm wave gliders. You may wish to consider the Silent Gliss 1280 track if your curtains are on the heavy side of medium or heavy weight. This is another popular track for heavier curtains. The patented roller gliders glide on the rim of the front channel with very little friction for smooth and easy operation. This track is only available in white. Please download the Silent Gliss specification brochure here. The brackets are similar to the 1080 track and can be wall or ceiling fixed. The track is installed in the same way as the 1080 track, simply clipping onto the wall or ceiling fix brackets. If you prefer a corded track there are 3 popular tracks for domestic use; Silent Gliss 3000, 3900 and 3840 (please see specification details above for the non-corded 3840 track). 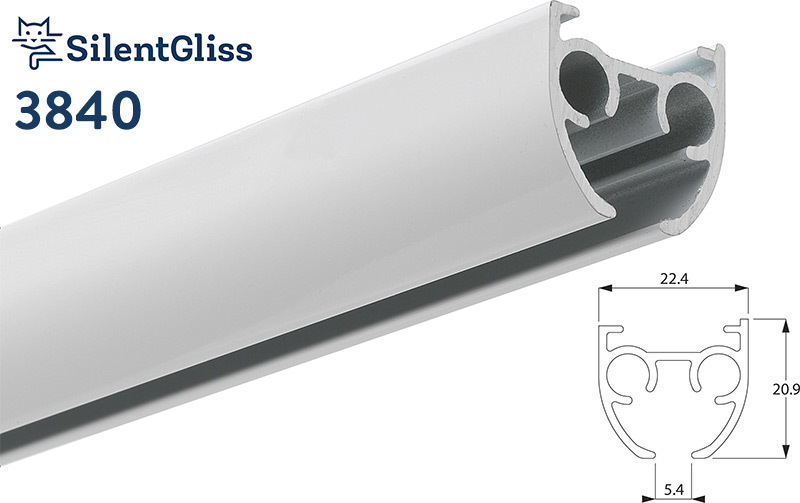 The Silent Gliss 3000 track is ideal if your curtains are light or medium weight. It is a strong and elegant curtain track. It can be corded both sides to offer extra flexibility and can be bent for bay or L shaped windows. The tracks are supplied with universal brackets as standard that can be wall or ceiling fixed. Easy installation. The track is available in white, silver, gold, brushed aluminium, black or antique bronze. Please download the specification brochure here. The Silent Gliss 3900 is a super, and very popular track suitable for heavy weight curtains. The ‘roller’ gliders glide on the rim of the front channel with minimum friction enabling a smooth glide. It is available in white and comes with universal brackets that can be wall or ceiling fixed. Can be corded from both sides. Silent Gliss recommend straight tracks of 400cm and bent tracks over 300cm are corded both sides. You may also wish to consider this on shorter lengths if your curtains are particularly heavy, or if you would like to operate your curtains independently to each other, to block out the sun on one side of your room for example, or if you have one curtain that is wider than the other. The Silent Gliss 3840 offers the same benefits as the non corded track (please see information above). The track can be corded both sides which is recommended on straight tracks over 400cm or on bent tracks over 300cm. You may also wish to consider this on shorter lengths if your curtains are on the heavy side, or if you would like to operate your curtains independently to each other, to block out the sun on one side of your room for example, or if you have one curtain that is wider than the other. This does mean the track will come in 2 pieces with an intermediate pulley. The Silent Gliss 6243 has been designed to be ceiling recess fitted and as the track is hidden in the ceiling profile it offers a sophisticated, contemporary perfect finish to modern interiors. The slim track profile (just 5.4mm wide) is suitable for medium to heavy weight curtains. It is also suitable for wave headings and can be supplied with 60mm or 80mm wave gliders. We can also bend this track in our factory for bay or L shaped windows. A timer model which allows you to set pre determined times to open and close your curtains. This is excellent if you are going away and leaving your house empty for a period of time. A remote control allowing you to open and close your curtains from the comfort of your own bed or sofa! A total control model combining both the timer functionality with a remote control option as well. We make the Silent Gliss 5100 tracks to your exact length and delivery is within 3-4 working days of your order confirmation. 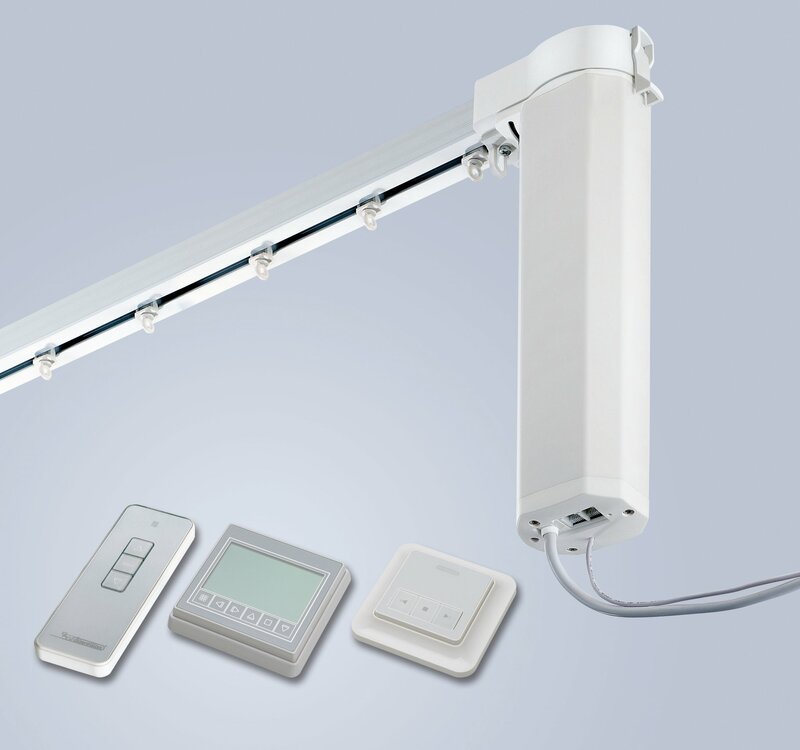 Please view the Silent Gliss 5100 Product Brochure here. You can specify which side you would like the motor to go on and the track can be ceiling or wall fixed. It is also suitable for the wave heading system and can be bent for bay windows or L shaped windows. For technical information please click here to view the Silent Gliss technical brochure. Please get in touch if you would like any further information or advice, have any questions or would like a quotation for anything that isn’t the standard specification.